Well, fall is officially here! In the heat of summer, I find myself craving fall… Yet as a gardener, there is a certain sadness that comes with the end of the summer abundance. My summer crops grow more and more slowly now, and the average first frost date – when they will be officially done – is only a month away. We can continue to harvest the frost-hardy fall plants we hopefully put in during August and September for a couple more months, but the time for planting is winding down. Only the hardiest of greens like spinach or alliums like garlic and onions are left on our list. 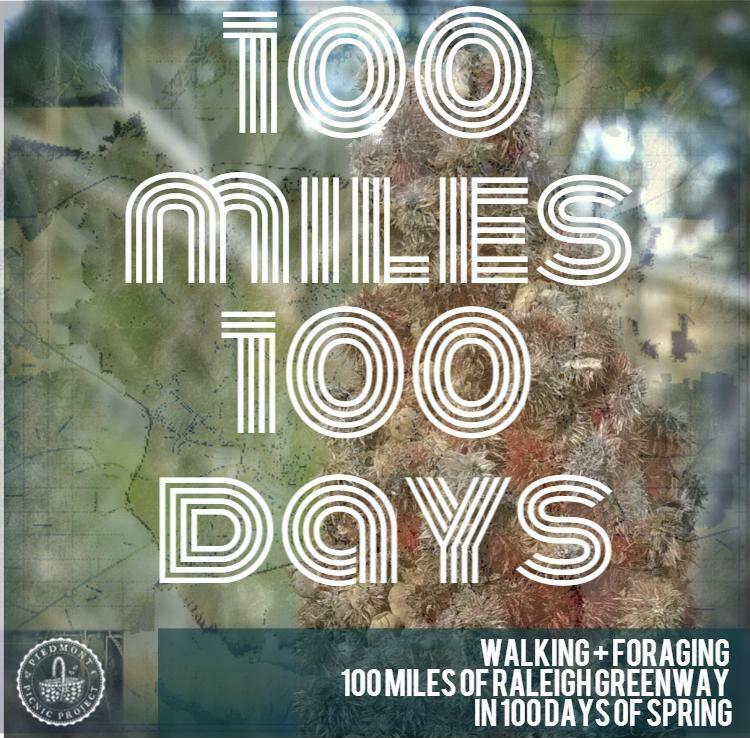 The seasons really start to mean even more as you involve yourself deeper in growing or foraging your food. Fall is a time of straddling two extremes – harvesting the last of the abundance of summer while winding down in preparation for winter. Fall is our last chance to put up the harvest so that our winter selves will thank us when we open a jar of summer in the cold months of January and February. Fall is also a time to invest in next summer’s harvest through planting root crops like onions and garlic that won’t be ready for months to come. See what’s left in our guide below! If you’re not too buried in a pile of tomatoes or zucchini this time of year to think about planting more in your garden, August can be an exciting time to plant! There are still a few “quick maturing” crops you can get in the ground for summer – like bush beans and cucumbers. But I think the really exciting things are the fall crops! Think of almost everything you might have put in your spring garden – peas, cabbage, broccoli, greens… All of this has another chance to be planted now for a fall (and even into winter) harvest! 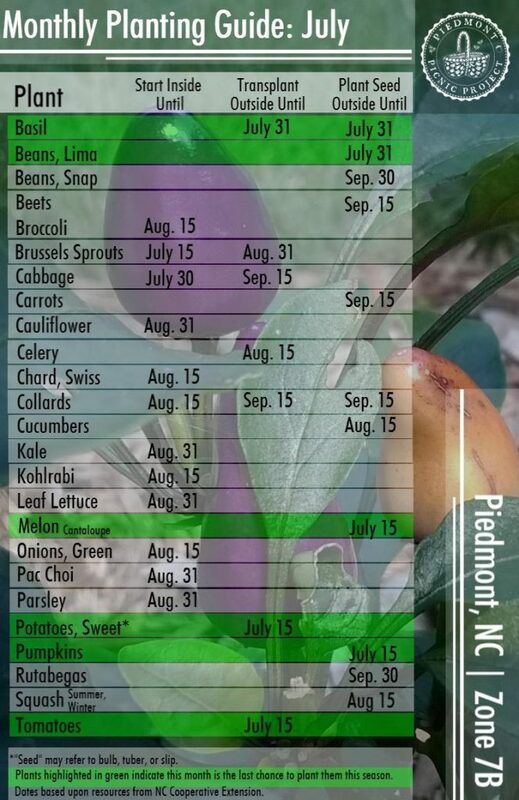 See our Monthly Planting Guide for August below for the details. If you don’t have an empty bed, stick fall crops in around your summer ones – they’ll appreciate a little shade. When it’s time to pull out the no-longer-productive summer crops, your fall crops can have all the space and all the light! Some like it hot! And that’s the truth for the July issue of our Monthly Planting Guides! 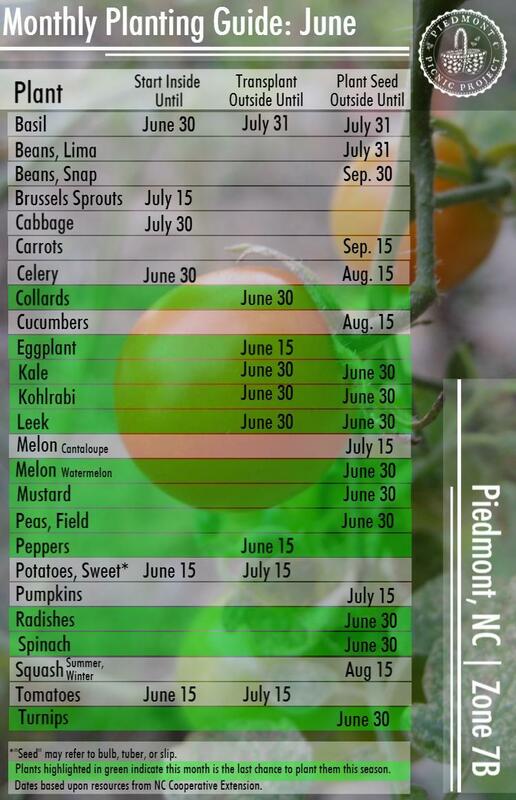 July is the last chance for some heat-lovers like tomatoes, melons, and sweet potatoes. But don’t think it’s the end of planting season! 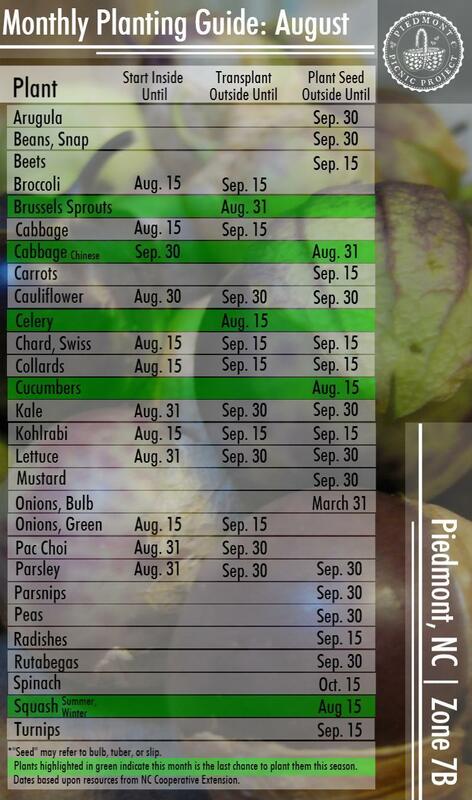 It’s also time to start thinking about your fall garden with cool weather crops like brussels sprouts, beets, and carrots. That’s right! We just got back from the beach, but don’t worry, we didn’t take the week off. To keep you entertained, while we were on vacation, we looked into things to forage on the beaches of NC… What did we find? We foraged seaweed for extra nutrients in the compost pile, picked sea rocket and wild roses, and made our own sea salt! All things you can try out next time you pop over to the beach. Check it out below. Wild beach roses were turned into an infusion and then into a yummy beachy cocktail (of course!). Finally, our grand finale… If you are trying to eat more locally, how do you localize your salt intake? 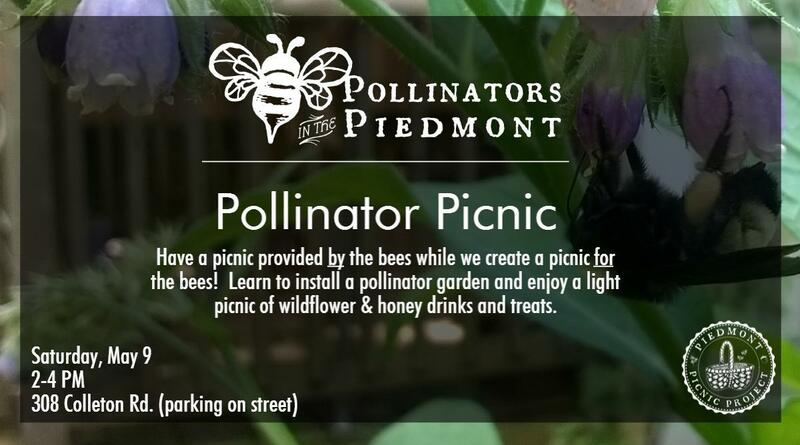 Well, if you live in the NC Piedmont, in less than 150 miles, you can make your own local sea salt! We just strained the seawater and then dehydrated it until nothing was left but the salt! 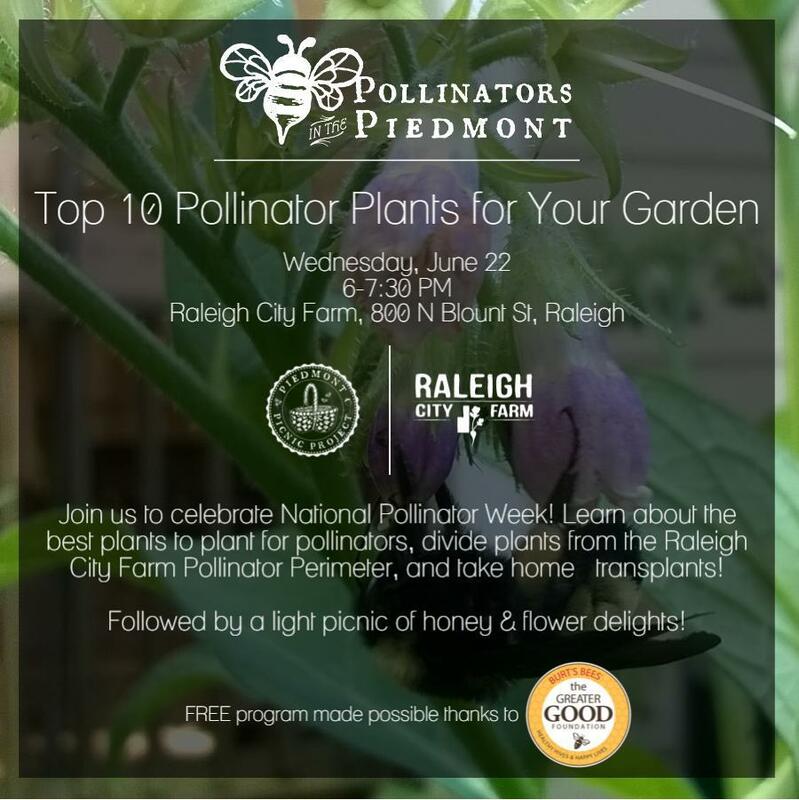 Wondering what you can still plant this month in the Piedmont, Zone 7B? We’ve got you covered! 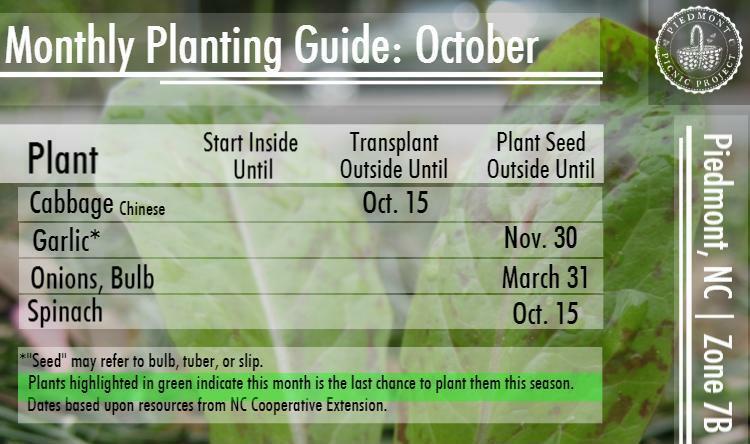 There’s still time to put out a few key summer transplants like tomatoes and peppers… but it’s also time to think about starting those fall transplants from seed indoors! 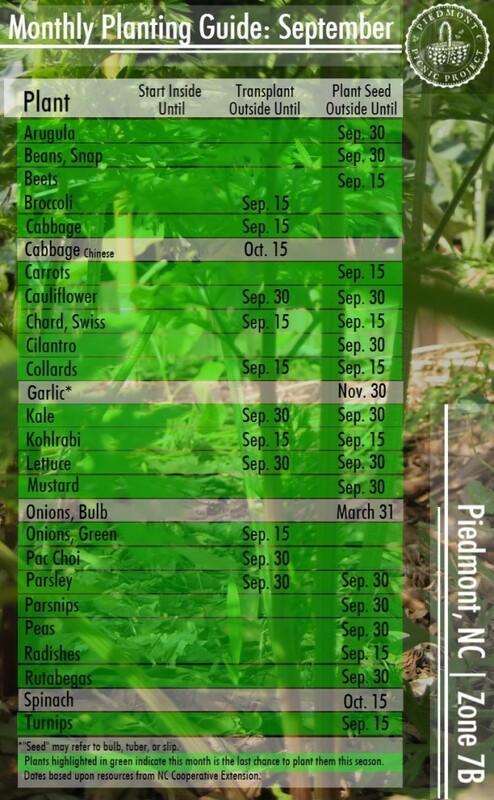 Check out our latest installment of our Monthly Planting Guides! May is an exciting month! 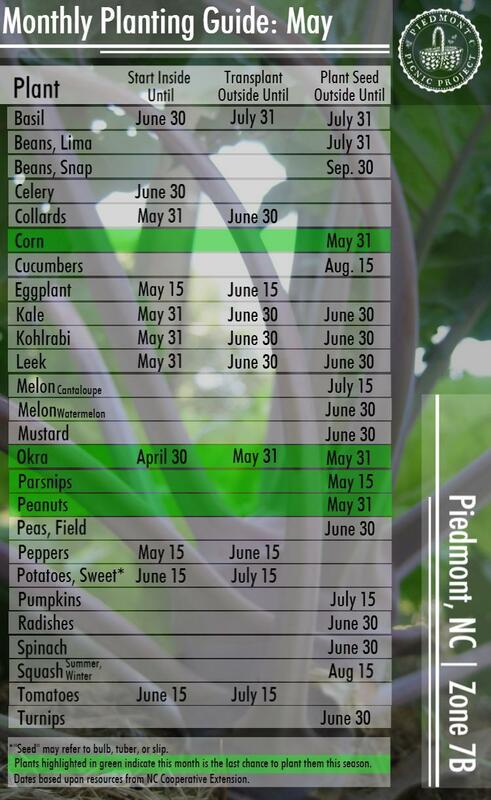 It’s too late for most of your spring crops at this point, but summer crops are now all fair game… including heat-lovers like okra and peanuts! But be sure to get those in fast – your window is short.